It's important to understand what drains the most power in your laptop. In modern laptops, the LCD display consumes about 43 per cent of normal operating power. Under the hood, the chipset - video, graphics, audio, math coprocessor, etc. - eats another 22 per cent. The CPU accounts for 9 per cent of power consumption, while a graphics processor takes another 8 per cent. The hard drive takes only 5 per cent, and network adapters consume only 4 per cent. So obviously, power conservation efforts should focus first on the display. Here's how to tweak your settings to save the juice. Windows has a Power Options section in Control Panel that can help you optimize your laptop's performance vs. power consumption trade-off. You can use one of the pre-defined Power Plans that kick in depending on whether you're operating on battery or wall power. The plans control how bright the display is; when to turn off the display during periods of inactivity; when to turn off the hard drive to save power; and what CPU performance level to use when on battery power. Mac OS X users can use the "Energy Saver" option found on the System Preferences screen, to control when to when to power down the display or hard disks. Tweaking these plans to fit your computing habits and performance needs can extend battery life significantly. To "wake up" your computer if the screen is off, move the mouse, or press a key on the keyboard. You can also manually adjust the display brightness to suit the environment; you don't really need the brightest setting in a dim coffee shop. On most Windows laptops, you can change the screen brightness by holding down the Fn button and pressing one of the function keys on the top row of the keyboard. On my Toshiba laptop, Fn+F6 reduces the brightness, and Fn+F7 will make it brighter. On a MacBook, you can use the F1 and F2 keys, or the "Displays" option found on the System Preferences screen to adjust brightness. When power is low, turn it down as much as possible. To further stretch your battery time, avoid video games, listening to music, watching videos (especially high-resolution videos) and other graphics-intensive applications while on battery. Turn off the wifi adapter if you don't need to access to the Internet. And of course, don't try to charge your iPod or cell phone via the USB port, if your laptop's battery life is dwindling. It's worth noting the difference between Windows "sleep" and "hibernation" modes here, as either can be set in the Power Options plans. Sleep mode stores your laptop's current state, including all open apps and data files, in RAM before shutting down virtually all of your system. A bit of power is used to maintain the state of RAM so it isn't lost during sleep mode. Hibernation saves the laptop's state to the hard drive, allowing the laptop to shut down completely when it is not in use. Your desktop is restored from either mode, but restoration is faster from sleep mode because everything is already in RAM. Restoring from hibernation takes a bit longer, depending on the speed of your system. Hibernation is also safer, because power might be lost during sleep mode and all your data would be lost too. Hybrid Sleep (a combination of Sleep and Hibernation) is available in Windows Vista and later Windows editions. This mode saves the contents of memory to hard disk, just like hibernation, but then goes into sleep mode, rather than hibernation. You get the benefit of fast resume from sleep, or if power is lost, the ability to resume from hibernation. To turn on Hybrid Sleep, open the Power Options on the Control Panel, then click the "Change Plan Settings" link next to the selected power plan. Next, click the "Change Advanced Power Settings" link. Click the plus (+) sign next to the "Sleep" item, then click the plus sign next to "Allow Hybrid Sleep." Every battery wears out eventually. The number of times you can recharge a battery depends on many factors, but just a couple of rules will help maximize your battery's service life. Do not fully discharge your battery deliberately. Old nickel-cadmium batteries had to be fully discharged from time to time, but modern lithium-ion batteries' life spans are actually shortened by full discharges. I'm often asked if it's good or bad to keep your laptop plugged into A/C power for long periods of time. I've researched this, and the consensus seems to be that it's (usually) okay to do so. When your laptop's battery reaches 100% the battery stops receiving energy, so you can't overcharge it. However, heat is the enemy of all electronics, and batteries are no exception. If your laptop gets too hot, it can shorten battery life. Use a free temperature monitoring utility to keep tabs on your temps, and if the CPU or hard drive typically runs over 50 degrees Celsius, it's a good idea to remove the battery while running on A/C power. Of course, don't yank the battery while the laptop is running, though. Shut it down first, remove the battery, and store it in a cool, dry place until you need to go mobile. When your battery will no longer hold sufficient charge to get you through the day, it's probably time to buy a new one. (But first, see Can I Revive My Laptop Battery?) Consider extended-life batteries with more cells (and weight), and look into refurbished laptop batteries that can save you 50 per cent or more vs. the cost of brand-new ones. 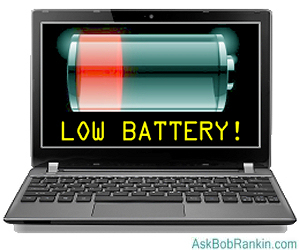 Most recent comments on "[HOWTO] Extend Your Laptop Battery Life"
Thank you Bob, the hybrid sleep should avoid unsaved data loss whenever there is an overnight power outage - not uncommon at this season. Would I be right in thinking that selecting "sleep" from the "shut down or sign out" menu will now go into hybrid sleep? Bon nadal, as they say round here. EDITOR'S NOTE: You'd have to check the Hybrid Sleep setting, so make sure it's on. It is also worth noting that not all laptops have user removable batteries. I generally keep my battery out of my laptop unless I'm mobile only. I've read it both ways from techies, leave it out when on AC, leave it in on AC. It does run cooler on AC without the battery and I keep the back elevated off the table/desk for more air flow(haven't found a cooler I'm excited about yet). I do however, run my laptop with and charge my battery at least once monthly. My wife and I have 17 inch laptops which we use daily. Hers is a Toshiba and mine is an HP. We keep them plugged in 100% of the time we are home. If we take them in the motorhome, they are plugged in only to recharge them. Both batteries still have several hours when first used unplugged. IMHO, keeping them plugged in is not an issue.